Christmas in the West Bank: The Christian population of Bethlehem and the entire “West Bank” area has been on a major decline since President Bill Clinton’s celebrated “Oslo 2 Accord” that handed the majority Christian areas to the Palestinian Authority, which was headed by Yasser Arafat at the time. Bethlehem and most other Christian towns are in Area A, the first area under full PLO authority. One of Arafat’s first acts was to increase the boundaries of Bethlehem to make the Christian population a minority. More than 800 children attended the first Christmas in the Holy Land event. Incredibly, this was the first non-denominational public Christmas party for children ever held in the Bethlehem area. Saudi Arabia then set up a banking routine that would lend any Muslim buying a Christian home 200% of the appraised value. In other words, a Christian could sell his home for double the value and hopefully, move to a friendlier environment. 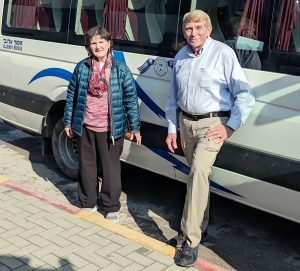 The Christian town of Beit Jala now has more former residents living in Chile than there are Christians left in Beit Jala. Since the signing of the Oslo 2 Accord and the Palestinian Authority takeover of Bethlehem, the Christian population has sunk to just 10% of the population. It is no longer safe for a Christian woman to leave home unaccompanied unless she wears a hijab. The Christian population is no longer self-sustaining. It is with that understanding that Christmas for Refugees agreed to hold a Christmas party for 800 Christian children still living in the Bethlehem and Beit Sahour area, to bring some joy to the shrinking Christian population. Note: Christ was actually born in what is now Beit Sahour, and the Christians of that town have held fast and refused to move regardless of the money offered to them for their homes — in a stark contrast to the Christians of Bethlehem who have mostly left the area. Beit Sahour is the location of the Shephard’s Field and Mary’s Well. A large public hall was rented for the Christmas in the Holy Land celebration. 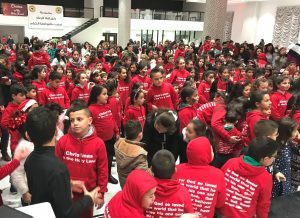 Each of the 800 children attending received a hoodie with John 3:16 on the back and “Christmas in the Holy Land” on the front. Each child also received a gift at the end of the Christmas party. The event itself included puppet shows, singing, games and a coloring contest. Our journey to the Holy Land: The distance from Amman, Jordan to Bethlehem is less than 70 miles by car using the Allenby Bridge (which is highly discouraged by the U.S. State Department because it passes from Jordan into the Palestinian Territories). Regardless, Israel controls the border crossing. To get to our event in Bethlehem we had to drive to the Allenby Bridge, leave our vehicle and then take a bus across the bridge. On the other side we had to pass through Israeli immigration and customs and then take a new vehicle we had arranged for. A car with special license plates was provided for us by an Orthodox bishop, and this allowed us to pass through security check points between Israel and the Palestinian Authority areas. The wall that Israel has built separates Jerusalem from Bethlehem and the other Christian towns on the “West Bank.” There is, of course, a security check point to get through the wall. We stayed at the St. Gabriel Hotel in Bethlehem. I have known the Christian family who owns the hotel for nearly thirty years. The Christmas Party for the Christian children still living in the West Bank was a huge success. Please pray for the Christians who remain in the “West Bank,” particularly the children who are being raised under circumstance that are very difficult for them.